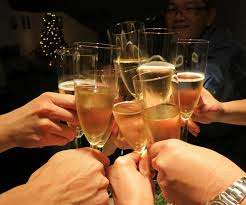 Happy New Year to all and try to find to take a moment out of the day toasting in 2016~~! Part 2 You Smoke? Well why don’t you just drink poison? Coronary heart disease by 2 to 4 times, (causing atherosclerosis=thickening of the vessels or due to arteriosclerosis=hardening of the arteries and remember smoking causes vasoconstriction of the vessels = increase pressure in the vessels = high B/P. Cigarette smoking causes reduced circulation by narrowing the blood vessels (arteries) and puts smokers at risk of developing peripheral vascular disease (i.e., obstruction of the large arteries in the arms and legs that can cause a range of problems from pain to tissue loss or gangrene) This pain to gangrene to amputation is due to lack of oxygenated blood getting to the tissue caused by the vasoconstriction the cigarette smoking caused. S. Department of Health and Human Services. The Health Consequences of Smoking: A Report of the Surgeon General. Atlanta: U.S. Department of Health and Human Services, Centers for Disease Control and Prevention, National Center for Chronic Disease Prevention and Health Promotion, Office on Smoking and Health, 2004 [accessed 2013 June 28]. S. Department of Health and Human Services. How Tobacco Smoke Causes Disease: What It Means to You. Atlanta: U.S. Department of Health and Human Services, Centers for Disease Control and Prevention, National Center for Chronic Disease Prevention and Health Promotion, Office on Smoking and Health, 2010 [accessed 2013 June 28]. Centers for Disease Control and Prevention. Annual Smoking-Attributable Mortality, Years of Potential Life Lost, and Productivity Losses—United States, 2000–2004. Morbidity and Mortality Weekly Report 2008;57(45):1226–8 [accessed 2013 June 28]. Centers for Disease Control and Prevention. QuickStats: Number of Deaths from 10 Leading Causes–National Vital Statistics System, United States, 2010. Morbidity and Mortality Weekly Report 2013:62(08);155. [accessed 2013 June 28]. Mokdad AH, Marks JS, Stroup DF, Gerberding JL. Actual Causes of Death in the United States. JAMA: Journal of the American Medical Association 2004;291(10):1238–45 [cited 2013 June 28]. S. Department of Health and Human Services. Reducing the Health Consequences of Smoking: 25 Years of Progress. A Report of the Surgeon General. Rockville (MD): U.S. Department of Health and Human Services, Public Health Service, Centers for Disease Control, National Center for Chronic Disease Prevention and Health Promotion, Office on Smoking and Health, 1989 [accessed 2013 June 28]. Ockene IS, Miller NH. Cigarette Smoking, Cardiovascular Disease, and Stroke: A Statement for Healthcare Professionals from the American Heart Association. Circulation 1997;96(9):3243–7 [accessed 2013 June 28]. Institute of Medicine. 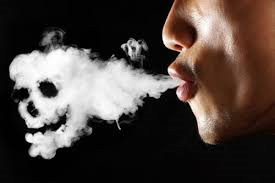 Secondhand Smoke Exposure and Cardiovascular Effects: Making Sense of the Evidence. [PDF–707 KB] Washington: National Academy of Sciences, Institute of Medicine, 2009 [accessed 2013 June 28]. S. Department of Health and Human Services. Women and Smoking: A Report of the Surgeon General. Rockville (MD): U.S. Department of Health and Human Services, Public Health Service, Office of the Surgeon General, 2001 [accessed 2013 June 28]. GET IT NOW? Please say yes. Smoking rots for your body not just in the lungs but everywhere. How do you make a complete turn-around? Look at your health in regards to what your goal is out of life. Do you want to live longer and most importantly HEALTHIER? When healthier in mind and body you are able to do more with your life in activities of daily living and more than that, so QUIT. If you want to sit most of your life with continuing to smoke but if not you must stop smoking now unless you have a unusual discipline in your way of living that allows you to have a about 6 cigarettes to 1 pack a YEAR, not daily. It is recommended you stop completely but if it actually has to be a part of your life than do it in moderation or less. If you’re able to do that your definitely not addicted to the bad habit physically, if anything addicted to it mentally. 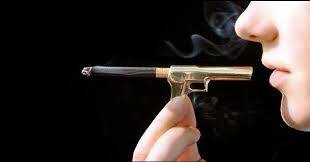 That would still make your life healthier as to smoking frequently every day. Know you take the risk of increasing your quantity in time so I recommend Quit. Various lifestyle factors have been associated with increasing the risk of stroke. These include lack of exercise, alcohol, diet, obesity, smoking, drug use, and stress. Guidelines endorsed by the Centers for Disease Control and Prevention and the National Institutes of Health recommend that Americans should exercise for at least 30 minutes of moderately intense physical activity on most, and preferably all, days of the week. Recent epidemiologic studies have shown a U-shaped curve for alcohol consumption and coronary heart disease mortality, with low-to-moderate alcohol consumption associated with lower overall mortality. High daily dietary intake of fat is associated with obesity and may act as an independent risk factor or may affect other stroke risk factors such as hypertension, diabetes, hyperlipidemia, and cardiac disease. Homocysteine is another important dietary component associated with stroke risk, while other dietary stroke risk factors are thought to be mediated through the daily intake of several vitamins and antioxidants. Smoking, especially current smoking, is a crucial and extremely modifiable independent determinant of stroke. Despite the obstacles to the modification of lifestyle factors, health professionals should be encouraged to continue to identify such factors and help improve our ability to prevent stroke, decrease cancers caused by smoking, decrease coronary artery disease, and obesity. Learn healthy habits or healthier habits, broaden your knowledge on the 4 food groups in what is lean or leaner or leanest with each group, increase your activity 30 minutes a day and learn what a healthy diet actually is through Dr. Wayne Scott Anderson’s book “Dr. A’s habits of health” and even if you need to lose weight we can show you the way to do it healthy, for example or many other authors available in how to live healthy. Wouldn’t you and the future want to get better in mind and body to impact our health care system that includes our insurance and most importantly lives of citizens in the USA in how they live (which would be more active). It just takes discipline and the drive to want to stay healthy or get in a better state of heath. Hope I have helped someone out there in broadening your knowledge regarding how to keep or reach a healthier life. Part 1 You Smoke? Well why don’t you just drink poison? Let’s start with what smoking actually does to the body. 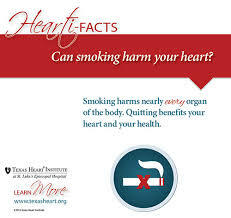 Smoking harms nearly every organ of the body. 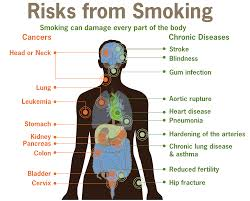 Smoking causes many diseases and reduces the health of smokers in general. It primarily starts at the lungs. How? Well think of your lung tissue with openings all over which are air sacs called alveoli. This is an anatomical structure that has the form of a hollow cavity which does the exchange of oxygen and carbon dioxide in and out of our body, when we inhale and exhale. The thing to know about this tissue is that before you start smoking the alveoli are expandable (think of it like a rubber band) allowing the person to get a good exchange of oxygen getting in the body to go to all our tissues and carbon dioxide getting out of the body (O2=oxygen being the fuel to our tissues and without it causes cellular starvation, carbon dioxide=CO2 being an acid / toxin to the human body and exhaled by the lungs). After years of smoking the alveoli stretches out not allowing a good exchange of O2 and CO2. The sad thing for a smoker is the alveoli cannot REVERSE back after damage has already occurred unless you had a lung transplant with continuing to smoke, which no M.D. or health insurance would allow. More realistic would be QUIT the bad habit. The tissue doesn’t get completely better but it improves when you quit. So the pt with Emphysema has alveoli that can’t exchange oxygen and carbon dioxide from the blood like it use to at the bottom of the lungs, prior to even starting to smoke. Also, after smoking years and when diagnosed with COPD you have difficulty breathing (that is why smoking is a major cause of bronchitis or Emphysema=types of chronic obstructive pulmonary disease=COPD and it is not REVERSIBLE). Emphysema is the worst type of COPD you can get. COPD is the third leading cause of death in the U.S., and the economic burden of COPD in the U.S. in 2007 was $42.6 billion in health care costs and lost productivity. Isn’t this reason enough to stop smoking? Emphysema is an enlargement of the air spaces distal to the terminal bronchioles, with destruction of their walls. People with emphysema have historically been known as “Pink Puffers”, due to their pink complexion. Chronic bronchitis is defined in clinical terms as a cough with sputum production on most days for 3 months of a year, for 2 consecutive years. People with advanced COPD that have primarily chronic bronchitis were commonly referred to as “Blue Bloaters” because of the bluish color of the skin and lips (cyanosis) along with hypoxia and fluid retention. Know when the lungs get effected in time the heart gets effected. One Affects the other in time. The heart can’t live without the lungs and vice versa. 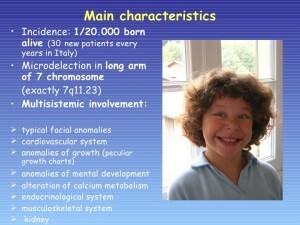 Williams syndrome (WS) is a genetic condition that is present at birth and can affect anyone. It is characterized by medical problems, including cardiovascular disease, developmental delays, and learning disabilities. The most significant medical problem associated with WS is the cardiovascular disease caused by the narrowed arteries. WS is also associated with elevated blood calcium levels in infancy. A random genetic mutation (deletion of a small piece of chromosome 7), rather than inheritance, most often causes the disorder. 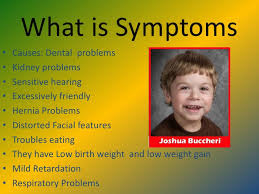 Williams syndrome is considered an autosomal dominant condition because one copy of the altered chromosome 7 in each cell is sufficient to cause the disorder. In a small percentage of cases, people with Williams syndrome inherit the chromosomal deletion from a parent with the condition. Most cases of Williams syndrome are not inherited but occur as random events during the formation of reproductive cells (eggs or sperm) in a parent of an affected individual. These cases occur in people with no history of the disorder in their family. However, individuals who have WS have a 50 percent chance of passing it on if they decide to have children. These often occur side by side with striking verbal abilities, highly social personalities and an affinity for music. WS affects 1 in 7,500 – 10,000 people worldwide – an estimated 20,000 to 30,000 people in the United States. It is known to occur equally in both males and females and in every culture. Unlike disorders that can make connecting with your child difficult, children with Williams syndrome tend to be social, friendly and endearing. Parents often say the joy and perspective a child with WS brings into their lives had been unimaginable. However, individuals who have WS have a 50 percent chance of passing it on if they decide to have children. The characteristic facial features of WS include puffiness around the eyes, a short nose with a broad nasal tip, wide mouth, full cheeks, full lips, and a small chin. People with WS are also likely to have a long neck, sloping shoulders, short stature, limited mobility in their joints, and curvature of the spine. Some individuals with WS have a star-like pattern in the iris of their eyes. Infants with WS are often irritable and colicky, with feeding problems that keep them from gaining weight. Chronic abdominal pain is common in adolescents and adults. By age 30, the majority of individuals with WS have diabetes or pre-diabetes and mild to moderate sensorineural hearing loss (a form of deafness due to disturbed function of the auditory nerve). For some people, hearing loss may begin as early as late childhood. WS also is associated with a characteristic “cognitive profile” of mental strengths and weaknesses composed of strengths in verbal short-term memory and language, combined with severe weakness in visuospatial construction (the skills used to copy patterns, draw, or write). Most older children and adults with WS speak fluently and use good grammar. More than 50% of children with WS have attention deficit disorders (ADD or ADHD), and about 50% have specific phobias, such as a fear of loud noises. The majority of individuals with WS worry excessively. Unfortunately there is no cure for Williams syndrome, nor is there a standard course of treatment. The prognosis for individuals with WS varies. Some degree of impaired intellect is found in most people with the disorder. Some adults are able to function independently, complete academic or vocational school, and live in supervised homes or on their own; most live with a caregiver. You may find the following resources about Williams syndrome helpful. These materials are written for the general public. After spending a wonderful holiday over the Christmas Eve and Christmas, some people feel blue and find that it’s difficult to function normally in their daily rhythm. As defined by the DSM IV, holiday blues, holiday depression, or post-Christmas blues, these commonly used terms depict the mental distress occurring after the winter holidays and festival season. This article is focused on experiencing the “blues” since this term suggests mild mental distress, a commonly occurring phenomenon when dealing with daily life stress and change. Whether that stress is financial or a full calendar of events, Dr. Miers said it can be hard to find a balance. Besides the stress, the holidays can also be a lonely time or a time of grief. Larry Collins lost his mother. Dr. Miers said it’s important to set new traditions, while also remembering the old ones. He added, helping others during your own time of need, can also do yourself some good. If you’re struggling this season seek for some for of counseling or help by a therapist or doctor. You can simple get involved with a community depression group. All you have to do is research on the internet. May all my fans and people in the world have a Merry Christmas! !